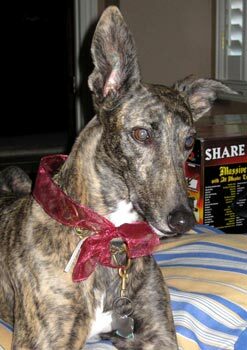 Caroline, aka Damon Hip Check, is a gorgeous 3-year-old brindle female, born February 10, 2001. Her sire is Gable Luke and her dam is Gable Icee. Caroline was found as a stray and turned into the Oak Cliff Shelter - and she was named after a doting staff worker there. 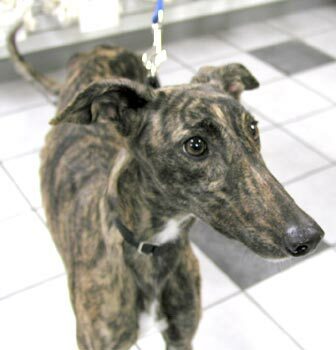 When she arrived at GALT, she was very thin, but has now gained weight and is ready to find her forever home. 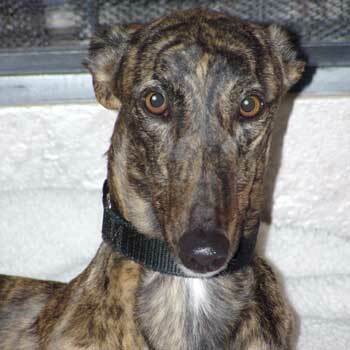 Caroline is friendly and outgoing with traits of an alpha personality. Caroline's racing record indicates she was at Gulf Greyhound Park and Corpus Christi for 54 races from January 5, 2003 to November 7, 2003. Caroline is interested in cats but is probably trainable.